State today finalized a detailed implementation plan for next year to curb air pollution in the State with focus on pollution reduction due to the burning of crop residue. 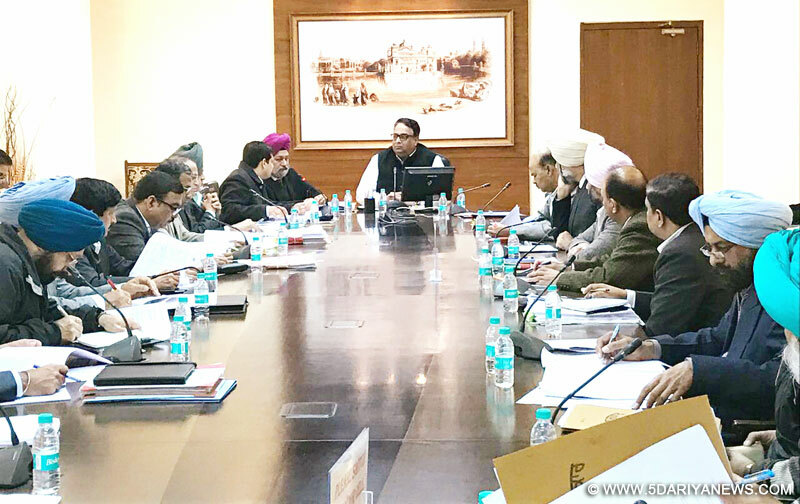 The implementation plan was finalized in consultation with Department of Agriculture, Science & Technology, Transport, Local Government, Rural Development, Punjab Agricultural University, Punjab Pollution Control Board and other concerned agencies in a meeting held under the chairmanship of Mr. Sarvesh Kaushal, Chief Secretary Punjab. The plan components included from Transport department were promotion of e-Rickshaws and CNG fitted vehicles and ensuring the supply of CNG in the State by coordinating with National oil marketing companies.Mr. N S Kalsi, Additional Chief Secretary Development stated that the management of air pollution levels in the State are being monitored with very stringent timelines by Hon’ble Supreme Court, Hon’ble Punjab & Haryana High Court, Hon’ble Delhi High Court, National Green Tribunal and other agencies of Government of India. He further stated that State has to utilize all its resources to the maximum capacity to reduce the air pollution levels in the State. The initiatives discussed to reduce air pollution includedPAU developed straw management system (SMS) appliance which is an attachment to the combine harvesters.In SMS system, as the combine harvests and threshes the paddy, the attached machine behind it evenly distributes the crop residue in the field. The university official stated that PAUhas recently also modified the Happy Seeder itself by attaching a ‘press-wheel’ to the machine, which again helps in formation of uniform rows as the stubble gets settled and enabling the wheat seeds to be neatly sown. Chief Secretary instructed Department of Agriculture, Science & Technology to coordinate with PAU to take the technology to the farmers and motivate all the farmers of the State to adopt the latest technology. Punjab Pollution Control Board was also directed to ensure that suitable instructions should be issued to combine harvester to cut the crop very near to the ground level so that very less crop residue remains in the field to burn. Transport Department was directed to make it mandatory for the new combine harvesters to attach SMS system appliance with their combine harvesters and also cut the crop near to the ground levels so that only a little crop residue remains in the field. All current combine harvesters shall also be fitted with SMS system appliance by October 2017. SMS appliance costs only Rs. 1.5 lakhs which is very minuscule as compared to the income generated by the combine harvesters.Such steps with focus on technology are very necessary in long term to reduce the air pollution levels in the State without putting much direct pressure on farmers.To use crop residue as asset, the Department of Animal Husbandry shall finalize a proposal as to how crop residue of paddy can be used as fodder and Department of Industries shall submit a proposal as to how more paddy straw can be used for generation of energy. It was decided that Farmers should be provided with Happy seeders in agricultural fields to ensure removal of agriculture residues and Government shall focus on its utilization for power generation, biomass plants, cement plants, industries manufacturing and Allied products. Other components of the implementation plan included introduction of vacuum cleaning machines&mechanical machines for removal of dust and waste from roads. The Plan for the Department of Health included provision of health care and immediate treatment to the public who suffer from effects of air pollution. Department of Local Government shall also ensure that all its parks, flyovers, roads have enough greenery which shall help in increasing the oxygen levels by 20%. Chief Secretary directed all the concerned Departments to provide status reports on all the Air pollution reduction components every fortnight and same shall be reviewed monthly by the Chief Secretary. The meeting was attended by Additional Chief Secretary Development, Mr. N S Kalsi, Mr. D P Reddy, Additional Chief Secretary Local Government, Mr. Viswajit Khanna, Additional Chief Secretary Housing & Urban Development, Mr. Vajralingham, Additional Chief Secretary School Education, Mr. S R Ladhar, Financial commissioner Rural Development, Mr. Anural Verma, Secretary Science Technology & Environment and other concerned officials. State Technical Universities To Adopt The Resolution Against " Conflict Of Interest"